The building sector is transitioning toward increased transparency, improved material health standards, and greater environmental impact awareness. WholeTrees is proud to be a part of this movement, and we show our commitment in a number of ways. Pioneering transparency in building products is important to us. 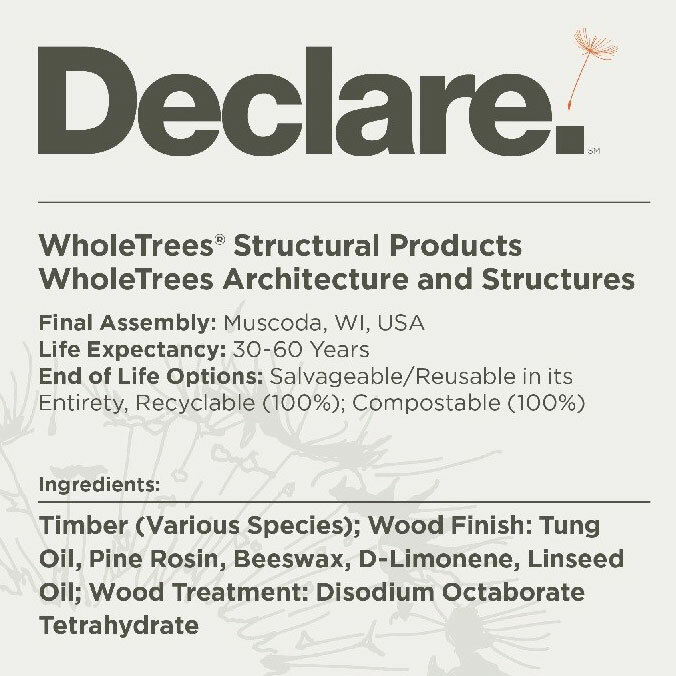 WholeTrees recently received the Declare label from the International Living Future Institute. Our structural products are Red List Free and we disclose all ingredients. This label also contributes to LEED v4 material credit MR115 for material ingredient disclosure. Consumers are increasingly concerned with the health of materials and how they affect our dwelling spaces because of the amount of time spent indoors. History has shown that when we do not consider the ingredients of our building materials there are negative effects, as ween with asbestos and lead. Material health has never been an issue for WholeTrees due to the simplicity of our products. Trees have abundant natural qualities that provide superior performance without heavy chemical treatment. Our products are finished with a borate treatment and tung oil-based finish that enhance the components’ durability and beauty without harming occupants. To further comply with the transparency and human health movements WholeTrees has completed Health Product Declarations to comply with Google’s Healthy Building Material Database, Portico. We collaborate with institutions like ILFI and USGBC to help push the market forward. Material health impacts go hand-in-hand with impacts on the environment. A 2011 Life Cycle Assessment completed by Christopher Cooke of Yale School of Forestry showed small diameter round timber’s low impacts on the environment compared to other building materials. A 40-year-old tree has sequestered about 1 ton of carbon over its lifetime, meaning our structures directly combat climate change and can be composted back to the earth at the end of their service lives. WholeTrees creates incentive for sustainable forestry by adding value to forest thinnings, urban trees, and invasive species, which are considered waste or too small to be milled. WholeTrees found its roots in sustainable forestry and environmental stewardship at the Driftless Farm near the woodlands of La Crosse, Wisconsin. Co-founders Roald Gundersen and Amelia Baxter saw the need to instill a love for nature, promote conservancy, and restore a sense of awe and delight in our woodlands. Through our continued sustainability efforts we hope to catalyze healthy building material use and improve our built environment.